Ever since I was a kid and dreamt of having a big bossy sedan, these two cars kept me up at night. Now, luckily my career choice has given me the perfect tools to finally give that kid an answer - a Mercedes-Benz S 350 d and a BMW 730Ld M Sport. Being flagship sedans, these cars pack everything a manufacturer can possibly offer in a car. This means a lot of jibber jabber that you might not be interested in. So today, we will cut to the chase and will only focus on the things which matter and help you choose the right one as simply as possible. The 7 Series looks sleek, aggressive and tightly packaged, whereas the S has more flowing lines and looks a bit larger. The headlamps of the 7 shoot out lasers (we’re not kidding!) which have a range of up to 600 metres whereas the S gets 84 LEDs in 4 small lenses which can point in different directions. Both are pretty cool but at startup, the lights of the S put on a little show which is quite special. The kidney grille of the Seven has vents which open up when extra cooling is required whereas the S’ grille gets a radar for adaptive braking and more. Also, it gets the Mercedes hood ornament which adds class to the design. The 7 gets 19-inch wheels with 245/45 rubber at the front and 275/40 at the rear. The S, on the other hand, gets 18-inch wheels with 245/50 rubber at all four corners. When it comes to the alloy design, it's the 7 which gets our vote for looking that extra bit smart. From the side, though the 7 is marginally shorter than the S, it looks longer thanks to its lower height and sharp creases all around. Even from the back, it’s the 7 which looks more aggressive, with a sharp chrome line running across the taillamps. A standout feature of the 7 Series is the light carpet, which lights up a path to the car at night and looks really cool. 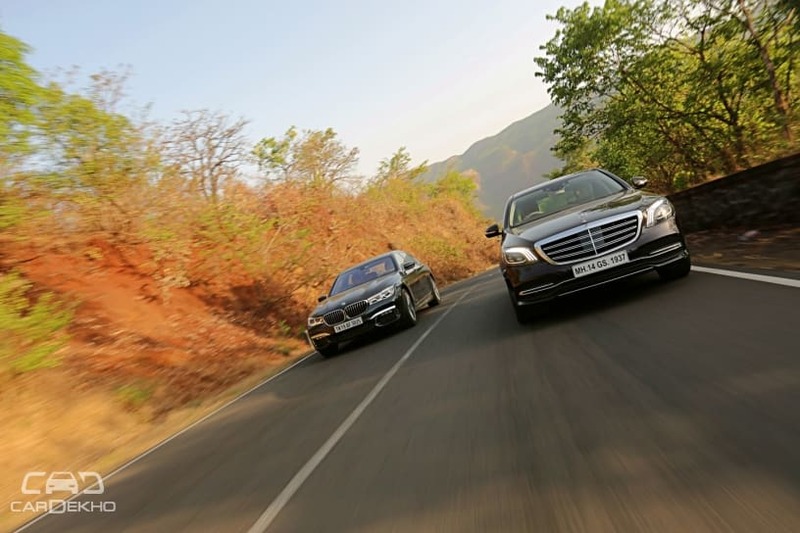 Where the 7 gets better road presence with its aggression, the S-Class does so with its elegance. If we were to pick one, it would be the 7 as it looks sharper and turns more heads. The S look has become all too familiar now thanks to its smaller sibling-like mini clones of the original. The BMW 7 Series’ cabin has an old-school charm, but packs tonnes of technology. It gets a lot of buttons in the centre console, which feels a bit cluttered. The S-Class, on the other hand, gets a much cleaner cabin with minimal buttons with the technology hidden underneath. The touchscreen on the top controls pretty much all elements of the car: comfort, drive, infotainment, settings and more. The infotainment screen on the S, though, is not touch-sensitive, but that only becomes a hassle while using 3rd party apps like Apple CarPlay or Android Auto. Both cars get rotary dials on the centre console to control the system. The S further gets two small touchpads on the steering wheel, from which the screen can be controlled. The one on the left controls the infotainment display and the one on the left controls the instrument cluster. The nice part is that they are very intuitive to use. The BMW 7 Series even gets gesture controls in the cabin with which you can control the media player or calls. But this feature feels more like a gimmick as both of those things can be controlled via the steering wheel buttons with more accuracy. High quality beige leather envelopes the seats of the 7 and is also present on the door pads and armrest, making the cabin feel premium. There is also use of polished wood on the dashboard and doors to add some richness. The cabin of the S makes you feel more special with matt finish wood running across the dashboard and flowing onto the doors, metallic knobs and vents for the AC; and silver contrast metallic elements with the brown-beige theme. Between the two, the S delivers a better in-cabin experience. Its look clean, premium and, like the outside, it has a flow to the design and feels more elegant. The cabin of the 7 feels airier as you sit a little higher, looking out of the large glass area. But the seats of the S do a brilliant job of contouring around you, almost like a tailored job. The seats of the S are just brilliant. The contours around the passenger feel like a warm hug. A special mention has to be made here of the head cushion, which feels like resting your head on a bed of feathers. The rear seat of the 7 is more spacious to seat three, and is quite comfortable too. But in comparison to the S, it ends up feeling like a bench - a good one though. Both get panoramic sunroofs with a sliding rear section. The sunroof of the 7 further gets reflective elements which take the colour of the ambient lighting. Speaking of which, the ambient lighting in the S-Class feels far superior than the 7. The colours are stronger and when they reflect off the light upholstery, the cabin almost entirely takes the shade of the light. It runs across the dashboard and onto the door pads seamlessly. The centre armrest of the 7 gets a tablet which controls things like all the sunblinds, seat functions like heating, cooling, recline and massages and in-cabin lightning. The S, on the other hand, gets a wireless charging pad to charge your phone hassle-free and even an NFC connection to wirelessly connect it. Next to it is a space to keep the remote which controls all aspects of the cabin. Between the two, the tab of the 7 is the more user-friendly experience. Both the cars get seat-mounted 10.2-inch monitors which are not touch-sensitive. The one on the S is more informative and easier to use and is controlled with a tv-like remote. The passengers can then look at navigation information, control seat functions, and a lot more. Both get blu-ray players as well. The massage function on the 7 is more thorough, but the S wont dissapoint you either. The most impressive feature, though, remains the way the right front passenger side seat folds to make more space for the boss seat and provide a footrest. While both the cars get it, the one on the 7 ends up being more comfortable and can be operated with a single click of the button. In the S, you have to keep the button pressed for the entire duration, which is irritating. To conclude, the S’ seats do offer better seating and a more premium cabin, but loses out when it comes to the ride quality, something we will discuss a little later. The 7’s sense of space, seat functions, ease of operating the tablet and especially the ride comfort makes a strong case. If you can live with a slightly stiff ride, the S is better. But if it is comfort you are looking for, it’s the 7 you should turn to. Both of these cars are powered by in-line 6-cylinder diesel engines. The Mercedes is the first BSVI-compatible diesel engine of the country. Also, it is the most powerful diesel engine in Mercedes’ lineup. The 3.0-litre unit in the S450 makes 286PS / 600Nm and comes paired to a 9-speed automatic. The 7’s engine is also a 3.0-litre block developing 265PS / 620Nm, mated to an 8-speed automatic transmission. When you talk about performance, both the cars are pretty neck and neck. The tested acceleration figures are almost the same, and so are the roll-ons and braking numbers. And, that's the way it feels from the cabin as well. Both these cars effortlessly commute in the city and are sublime to cruise on the highway. When it comes down to mileage, these ‘sensible’ diesels return close to 8.5kmpl in the city and 15.5kmpl on the highway. But when it comes to the ride, there is a clear winner: the 7 series. The ride feels soft, yet it is more composed than the S.
The 7 Series takes on bumps and broken roads flawlessly. It barely lets anything filter through to the cabin. And on the highways, it remains stable and comfortable. In the S-Class, the ride feels slightly stiff and it does get a little bouncy, but this significantly improves on the highways. Good things is that this harshness is reduced a lot by the well-contoured and comfortable seats. There is body roll on both the cars, but the air suspension of the 7 Series copes with the mass better than the S-Class. And though the S rides stiffer, it has a bad habit of scraping the underbelly. You will have to be extra careful over speed bumps and often increase the ride height just to clear obstacles. The 7 Series barely ever scraped during out test, making it the more practical option if you do not live in a tier 1 city. Both cars gets multiple driving modes to suit your driving style, or your driving mood. But the S-Class feels the most composed in Sports mode as the suspension settles quickly after an undulation. When it comes to handling, the 7 Series again gets ahead. It feels sharper than the S while changing directions, despite weighing close to 2 tonnes. The S is not a bad handling car in any sense, but it feels a little laid back and doesn't feel as exciting to drive as the 7 Series. Though both these sedans are not exactly meant to attack corners, the 7 with its wider tyres gives you a lot more confidence. Even with the traction control off, the grip that the 7 offers is quite impressive. Another thing worth a mention here are the active safety features on the S. It gets a radar at the front which auto brakes when it senses you are are going to miss yours. But, if the radar gets dirty, which in our conditions can very easily happen, it can cause some irregular warnings or even braking. Choosing between the two cars has been a lot more difficult than we thought. On one hand, the S-Class’ in-cabin experience, especially those beautiful seats, make you feel you are in the lap of premium luxury. But the generic looks of the family and the stiffness of the ride takes a bit away from the experience. The 7, on the other hand, has a cabin which is loaded with tech and leather, and feels airy with a large glass area. But the premiumness factor just doesn't hit the right note, especially when compared to the S-Class. The biggest turn on though, especially for people who would want to drive the cars themselves, is the way the 7 drives. It is unlike a large luxury saloon should, and dare we say, with a hint of sportiness. And then the superior ride quality which takes care of most of the bad patches on the road just gives it that extra edge. Both the cars are priced just a lakh apart, with the Beemer costing Rs 1.32 crore and the Merc costing Rs 1.33 crore (both ex-showroom). The above factors make the 7 Series our pick of the two. It just offers a better all-round experience. And though the S definitely has a better cabin, the experience is better with the 7.